I love doing holiday crafts with the boys and I have been seeing where you can make little thumbprint chicks. I have three boys (a 4 year old, a 2 year old and an 8 month baby). It’s not the easiest to get handprints from them, so this was a prefect craft for us! I’ve had this little canvas and easel for awhile now and thought this was the perfect opportunity to use it. I just love how my chicks turned out and it was so simple to make. Since I used the little canvas as my background, all I needed to do was paint it white. But if don’t want to use a canvas, cardstock would be another great option. I have even seen where people have used the thumbprint chicks on coffee mugs and greeting cards. I used yellow acrylic paint and dipped my oldest son’s thumb first and gently pressed his thumb on the canvas creating my first chick. Then I did my middle son’s and then the baby making sure I let each one dry before doing the next. Once the paint was completely dry, I used an orange Sharpie to create the chicks’ bills. Then I used a black marker for the eyes, wings and feet. 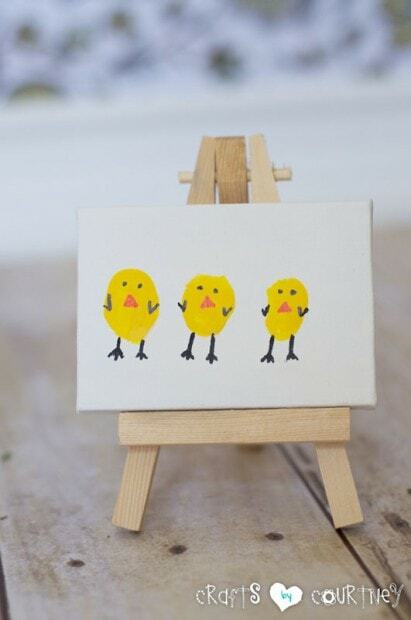 Then placed my little chicks on the easel to display!! This will be a craft I’ll bring out every year for my Easter decor. I just think my little thumbprint chicks are the cutest. Don’t forget to write the date on the back of all your hand and footprint crafts. Like I’ve always said, these kinds of crafts are my favorite. I love reflecting back on how little their prints WERE and how big they are NOW (especially the babies).